The piece is more or less rectangular. It is framed on all sides with a triple checkered band. There are two registers of representations, separated by a single checkered band. In the upper register, Osiris, Horus and Isis stride to the right. Osiris wears the Atef-crown, a collar and a short kilt, and holds a uas-sceptre. The falcon-headed Horus wears the Double Crown, a collar and a short kilt, and holds a uas-sceptre too. Isis wears a long wig and a close-fitting garment that does not cover the breasts. She is crowned with cow's horns and a sun disk, and carries a papyrus sceptre. To the right is a falcon wearing the double crown, to the left a ba-bird wearing the double crown. 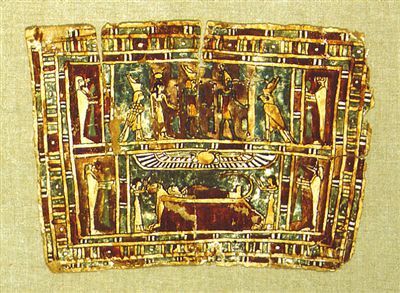 In the lower register, two women bewail a mummy lying on lion-shaped bier. They wear lang wigs and long, close- fitting garments; they raise their arms in mourning. The scene is crowned by a winged sun disk with two uraei. The Four Sons of Horus are depicted in the four corners, separated from the scenes by a checkered band. The falcon-headed Qebehsenuef is upper right, the human-headed Amset is upper left, the baboon-headed Hapi is lower left, the jackal-headed Duamutef is lower right. They are dressed in white mummy garments and hold cloths.